When I think about the month of September, several things come to mind: Labor Day BBQs, kids heading off to school, and the first day of fall. But this also marks the month we celebrate World Heart Day which, as far as worthy celebrations go, is at the top of my list. Though I would love to go to The Maldives or Switzerland and watch their monuments glow red on September 29th, this year I will be happily spreading the word here at home about a heart healthy diet, which is one of the best ways to fight CVD (along with physical activity and avoiding smoking). I generally prefer to focus on the delicious foods you should eat for heart health versus those that you should not. This includes plenty of whole grains; an abundance of fruits and vegetables (ideally fresh or frozen); omega-3 rich fish such as tuna or salmon; lean meats, poultry, dairy foods; and plant-based fats like olive oil, nuts, seeds and avocados. All of these foods offer their own unique blend of heart healthy nutrients, and dairy foods are no exception. However, what does distinguish dairy products from some of the other food groups is how many of the heart healthy nutrients are found in dairy products alone: potassium for blood pressure control, niacin for proper circulation, magnesium for heartbeat regulation, and vitamin B12 for lowering dangerously high levels of homocysteine (an amino acid associated with heart disease), just to name a few. World Heart Day is a great reminder to improve your cardiovascular health and wellness, but by no means should you wait till then to begin boosting your heart healthy nutrition. 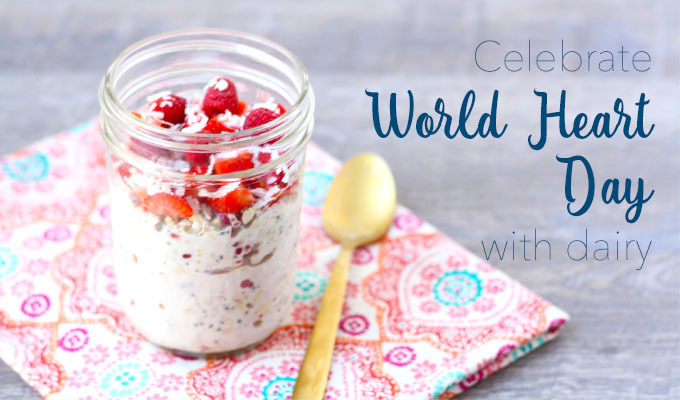 Start tomorrow morning with this whole-grain, dairy-packed, berry-licious breakfast! Katherine Basbaum is a clinical dietitian for the Heart & Vascular Center at UVA Health System. She received her Master’s in Nutrition Communication from the Friedman School of Nutrition Science and Policy at Tufts University and completed her dietetic internship at UVA Health System. Katherine is passionate about nutrition as medicine for chronic disease, and believes the key to her patients’ success lies in the establishment of realistic, achievable goals. When not at the hospital, you can find Katherine hosting heart healthy cooking classes in the community, conducting nutritional analysis for local restaurants and writing or speaking on the topic of heart healthy nutrition for local publications and media outlets.